Key Difference: North America is a continent that exists in the Northern Hemisphere and in the Western Hemisphere. At times it is also considered as a sub-continent of the Americas. USA, also referred to as United States of America, United States, or just America, is a country located in North America. Often, people confuse North America with USA; what they fail to realize is that North America and USA are two different regions. 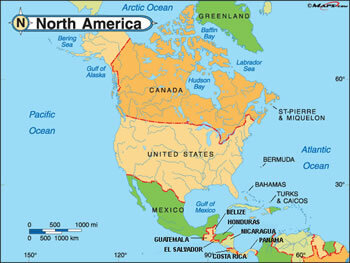 North America is a continent that exists in the Northern Hemisphere and in the Western Hemisphere. At times it is also considered as a sub-continent of the Americas. North America is the third largest continent in the world, according to area, after Asia and Africa. It has an area of about 24,709,000 square kilometers (9,540,000 square miles), which amounts to 4.8% of the planet's surface or about 16.5% of its land area. It is the fourth largest continent according to population after Asia, Africa, and Europe. 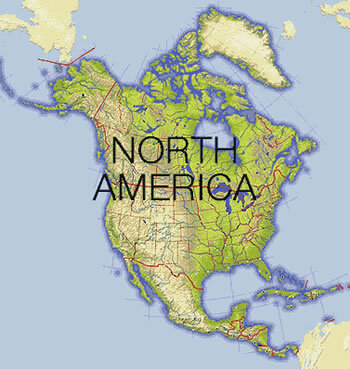 North America is bordered to the north by the Arctic Ocean, to the east by the Atlantic Ocean, to the west and south by the Pacific Ocean, and to the southeast by South America and the Caribbean Sea. North America includes a total of 23 countries, of which the two biggest is USA and Canada. The total population of North America is at nearly 529 million people, or about 7.5% of the total human population. While the discovery of America is credited to Christopher Columbus, the truth is that people were living there since as far back as the Ice Age, which was approximately around 18,000 BC. These people were known as Paleo-Indians (Paleoindians) or Paleoamericans. They came over a land and ice bridge called Beringia, which was situated over the Bering Strait from Asia (Eurasia) into North America. In 1492, Christopher Columbus left Spain in search of a faster route to India, however, instead on 12 October 1492, Columbus landed in The Bahamas, which he thought to be West Indies. Columbus’s discovery launched an Age of Exploration, where every European power wanted a piece of the New World. The Europeans brought with themselves new types of food, animals, improved technology and European diseases, which are credited for the reduction of most of the indigenous population. The rest were conquered in the name of colonization. The British would not have been left behind in the Age of Exploration. In 1607, the English created their first permanent settlement, the Virginia Colony at Jamestown, Virginia. The second was the Pilgrims' Plymouth Colony in 1620 at Plymouth, Massachusetts. This was the beginning of the United States of America (USA). USA, also referred to as United States of America, United States, or just America, is a country located in North America. It is a federal republic that consists of 50 states and a federal district. 48 of those 50 states, as well as the federal district or Washington D.C., are located on the main land, from the east coast to the west, in-between Canada and Mexico, whereas Alaska is the northwestern part of North America, located after Canada, and Hawaii is an archipelago in the middle of the Pacific Ocean. The country also has five populated and nine unpopulated territories in the Pacific and the Caribbean. USA has an overall area of 3.79 million square miles (9.83 million km2) in total and with around 317 million people. It is the fourth-largest country by total area and third largest by population. USA was originally 13 British colonies on the East Coast. They declared their independence from Great Britain on July 4th, 1776. Today, USA is one of the world’s leading economies. In fact, it is the world's largest national economy, with an estimated GDP in 2013 of $16.7 trillion – 23% of global nominal GDP and 19% at purchasing-power parity. The country is also the world's foremost economic and military power, a prominent political and cultural force, and a leader in scientific research and technological innovation. A continent in the Western and Northern Hemisphere. A country located in North America. Europeans in the 16th and 17th century.